Kashmir regret every killing that happens on its soil. Srinagar: The Joint Resistance Leadership has said that the use of a muscular military approach to counter an essentially political and human problem, is wrecking havoc in Kashmir. “The delay in the resolution of the Kashmir dispute ,the denial to engage with the sentiments and aspirations of the people of J&K and instead the use of a muscular military approach to counter an essentially political and human problem, is wrecking havoc in Kashmir especially on our next generation and consuming them , while those who are here to execute this policy are also under stress and paying a price with their lives,” the JRL said in a statement. Commenting on the incident at Lethpora Pulwama, JRL comprising of Syed Ali Geelani, Mirwaiz Umar Farooq and Mohammad Yasin Malik said that people and leadership of Kashmir regret every killing that happens on its soil. “As we witness killing of our loved ones our young,and shoulder their coffins each day we can feel and understand the pain and sense of loss that the family and friends of those who are killed go through , not for a day or two when everyone is expressing grief and condolences to them ,but the silent grief and loss that stays with them for a lifetime,” the JRL stated. JRL said militarisation Cordon and Search Operations, use of bullets &pellets blowing up homes, blinding and maiming, PSAs and torture as a means to crush legitimate political aspirations of a people has not only failed but worsened the situation. “If this death dance has to stop, if hatred and revenge has to stop, if killing and counter killings has to stop and if we really want peace in the region we have to put an end to hostilities,” it said. “And the most effective and civilised manner to do so , is to reach out and engage and listen to the concerns of all three stakeholders and address them in the spirit of humanity and justice. 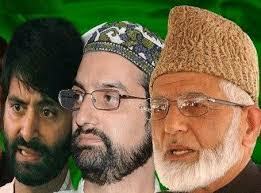 Resolve the Kashmir dispute for all times” .